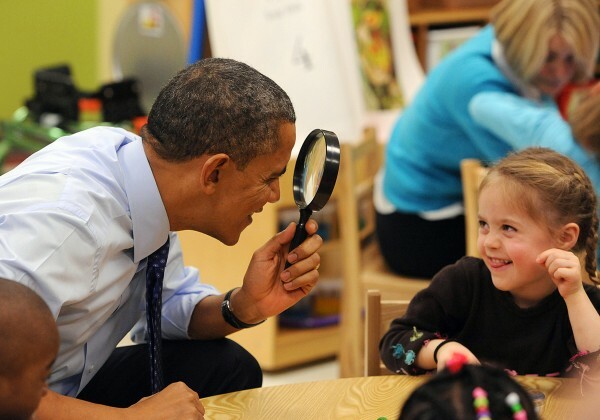 President Barack Obama uses a spy glass to play with a young girl at College Heights Early Childhood Learning Center in Decatur, Georgia, Thursday, February 14, 2013. You can think of high-quality, early learning programs as a long-term investment — as children who participate in them have a better chance of becoming educated and productive workers. You can think of early childhood education programs as a short-term investment, too, as they provide jobs for many people across the U.S., including about 10,000 in Maine. But, perhaps most important, you can think of the human aspect of preschool: If done right, it can help reduce, in the long-term, the income disparity that currently gives children growing up in poverty a deplorable chance of ever getting out of it. The president started the right conversation during his State of the Union address when he called for quality, universal pre-kindergarten. “For poor kids who need help the most, this lack of access to preschool education can shadow them for the rest of their lives,” he said. Obama’s proposal to institute state-federal partnerships to guarantee preschool to all 4-year-olds in families living at or below 200 percent of the poverty line is a smart one. He wants the programs to have state-level standards, small class sizes and instructors with the same level of education as those in K-12; local school districts and other partners would implement the voluntary programs. It’s not clear whether universal preschool has any chance of becoming law. But if it did, as with any large change, the challenge will be to ensure that it’s modeled after programs that have seen positive results and that there’s a way to pay for it. Sen. Susan Collins, R-Maine, said universal preschool is a “great idea” and “would be very helpful to a lot of working families,” but she wanted to see budget details. Obama said universal preschool wouldn’t add to the federal deficit, and administration officials said program costs will be included in the 2014 budget proposal Obama plans to present in March. For savings that change the ultimate arc of society — whether it’s reducing crime, improving high school graduation rates or simply boosting the number of civic-minded adults — universal preschool would need to follow the example of existing successful programs. One large-scale study examined the Child Parent Centers, which are operated by Chicago public schools for low-income children; they focus on literacy skills development and parent outreach. The study followed 1,539 children, starting in 1985-86, and documented their educational and social development. When measured against a comparison group, the preschool participants had a 29 percent higher rate of high school completion, a 33 percent lower rate of juvenile arrests, a 42 percent reduction in arrests for a violent offense, a 41 percent reduction in special education placement and a 51 percent reduction in child maltreatment, according to a 2001 analysis. The analysis also found that the preschool program generated a total return to society of $47,759 per participant (1998 dollars), with the largest benefit coming from eventual increased earnings capacity due to higher educational attainment. Can a similar program be instituted nationwide? It’s up to Congress. U.S. Rep. John Kline, R-Minn., chairman of the House Education and the Workforce Committee, expressed concerns, saying the government has “a poor track record of managing early childhood education initiatives.” But that doesn’t have to be the case; he has the authority to help make the program an excellent one. If Congress doesn’t listen to the many mothers and fathers who are calling for greater access to quality preschool, perhaps it will listen to military officers, who say early childhood education isn’t just an essential support for students, but for the future security of the country. Of course, the conversation about universal preschool is just getting started. The challenge along the way will be to identify the program components that, together, will provide the longest-lasting returns.